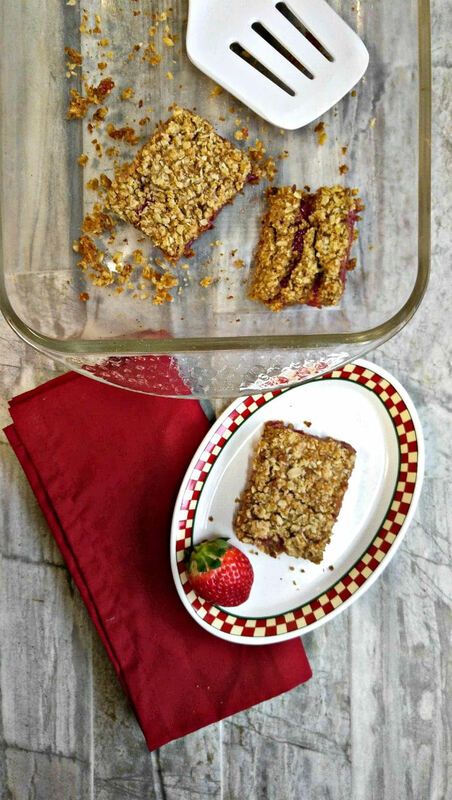 Fresh strawberries combine with old fashioned oats in these gluten free strawberry oatmeal bars. 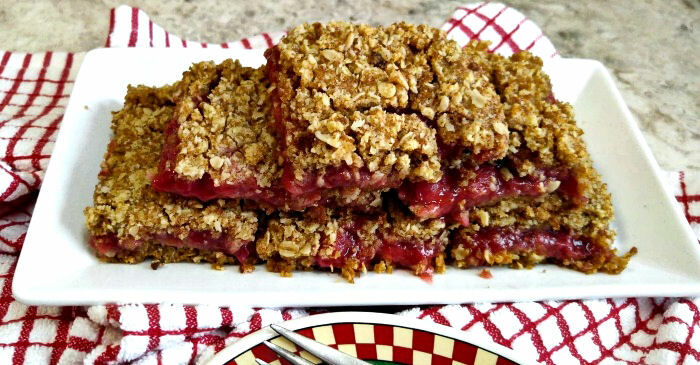 The bars have a buttery crumb crust, a sweet strawberry filling inside and a tasty and crunchy crumble on top. They are a great way to use up fresh strawberries for a dessert that everyone will love. I have included both a gluten free and vegan version of the recipe. It will soon be strawberry season and I can’t wait to start making bar recipes with them. Fortunately our grocery stores have a good stock of strawberries all year long, so we don’t have to miss out on fresh strawberry desserts just because the weather is cold. 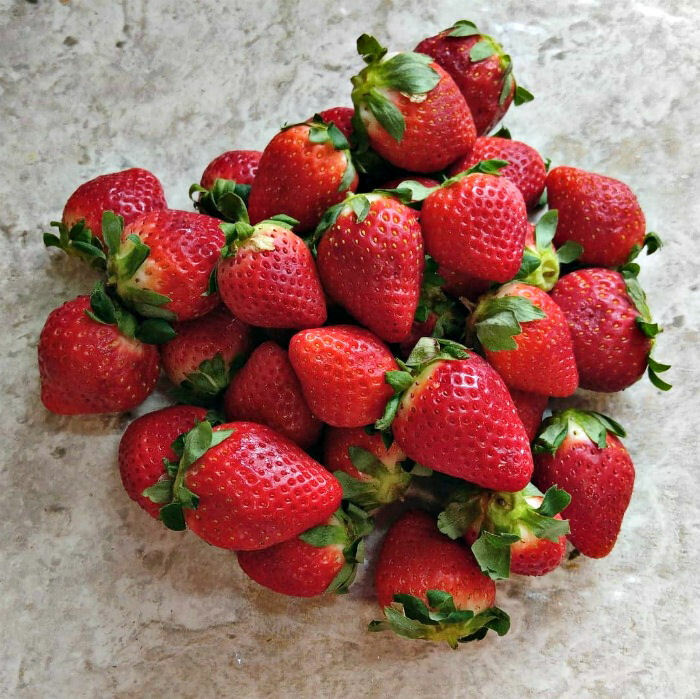 Fresh (and frozen) Strawberries are naturally sweet. You can use them in desserts without having to add a lot of extra sugar to flavor them. (Check out these delicious cupcakes with a strawberry buttercream frosting for another tasty dessert idea. It is very easy to adapt most dessert recipes to make them gluten free. For today’s recipe I am using baking soda and cream of tartar in place of baking powder, and Gluten free all purpose flour in place of normal flour. Oats are considered gluten free but if you are worried about cross contamination, you can also use gluten free rolled oats. Start with your strawberries. Remove the stems and blend 1/2 of them and set them aside. Slice the other half of the strawberries into big chunks. 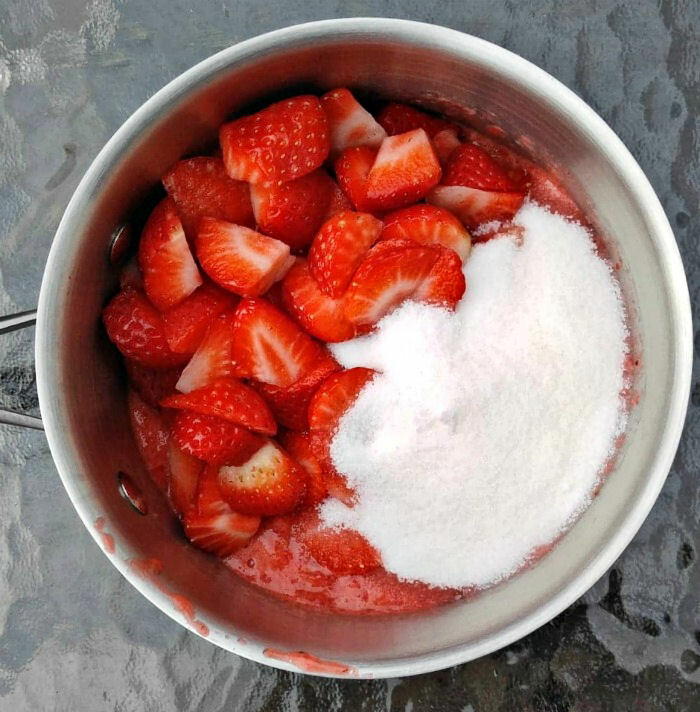 Place ½ of the strawberry puree into a small bowl and add the cornstarch. 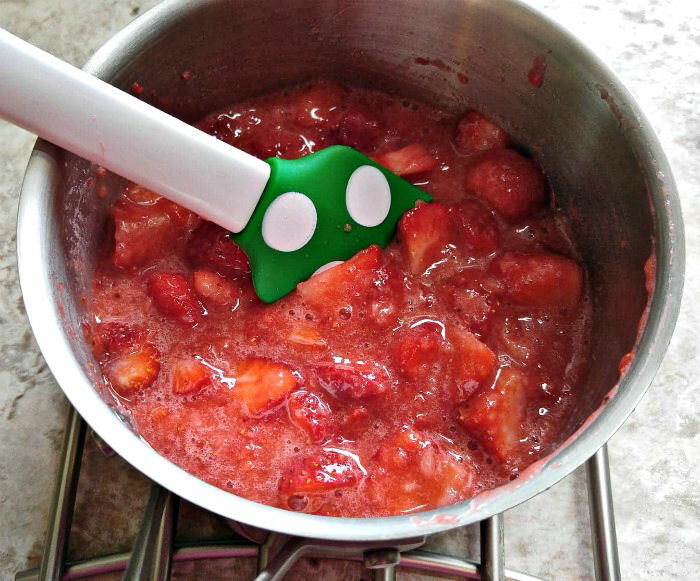 Mix well and put the rest of the pureed strawberries into a saucepan along with the puree and cornstarch mixture. Cook over medium high heat until everything is well combined. Now add the chunks of strawberries, the lemon juice and the granulated sugar. Bring the mixture to a boil, stirring the whole time. Cook until the puree thickens and set the pan aside to cool.I don’t like to use too much sugar, so I added just a third cup. If you like your filling sweeter, you can add more. The mixture will be sort of like a cooked strawberry jam. If you want it to be a thicker consistency, you can add more chopped strawberries. Set this mixture aside while you make the crumb crust and topping mixture. Let’s make the crumb crust. 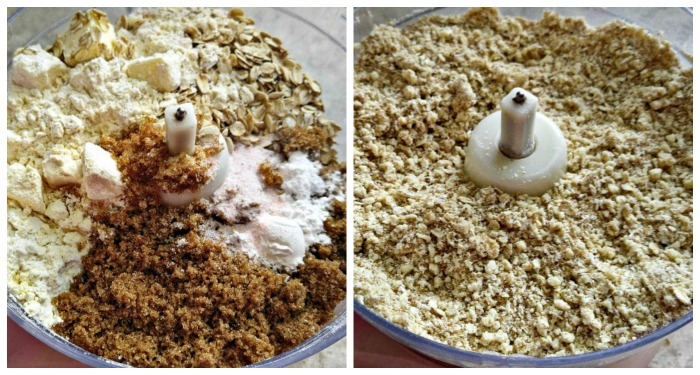 Combine all of the ingredients for the crust in a food processor and pulse until you have a nice crumbly mixture. ½ of the crumb mix goes in the bottom of a 9 x 13″ pan. I find it helps to line the pan with parchment paper to make it easier to remove the bars later. Pour the strawberry sauce over the crust, being sure to leave a space of about ½” all around the edges with no strawberry topping on it. 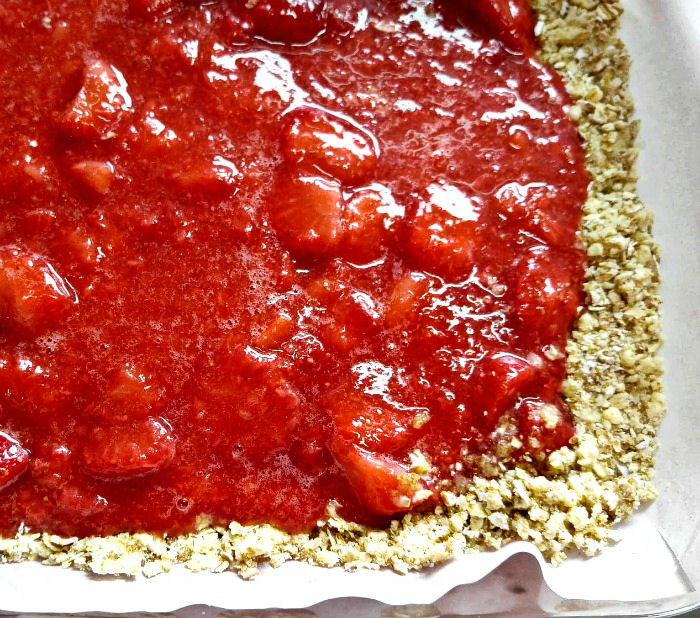 Add with the remainder of the crust mixture over the strawberry mixture and bake in a preheated oven for 35 to 40 minutes until the crumble is browned and the strawberry filling is bubbly. The bars must be completely cooled before you try to slice them. The filling is quite soft when it comes out of the oven and needs time to set so the bars will hold their shape. Tasting these sweet breakfast bars. These delicious strawberry oatmeal bars have the sweet taste of fresh strawberries in every bite. The buttery crumb crust and crumble topping is sweet and compliments the filling beautifully. The bars make a quick and easy breakfast on the go and are the perfect sweet ending to any meal. It’s a great dessert to serve for Valentine’s Day. 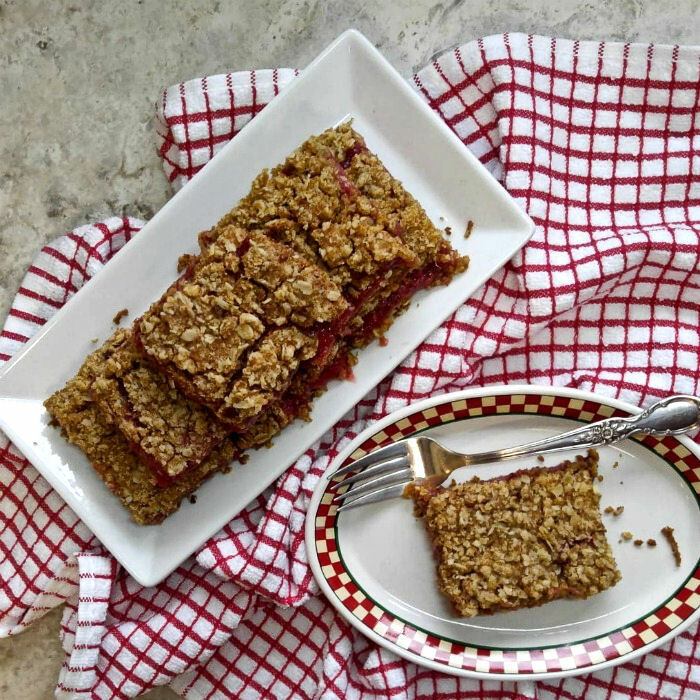 For a whole wheat version of this recipe, check out the this recipe for oatmeal bars with strawberries and wholewheat flour crumble on my gardening site. Vegan adaptations for the strawberry oatmeal bars. This recipe is fine for a gluten free diet but needs a few adaptations to make it vegan since butter and sugar are both a no no on this diet. To make this recipe suitable for vegans, use maple syrup instead of granulated sugar in the filling, and use room temperature firm coconut oil in place of butter and pure maple sugar in place of brown sugar in the crumble. Admin Note: This post first appeared in October of 2013. I have changed it to reflect the adjustments to make it gluten free and vegan and have taken new photos to demonstrate the recipe. For the original recipe with whole wheat pastry flour, see this page on my Gardening Cook Site. 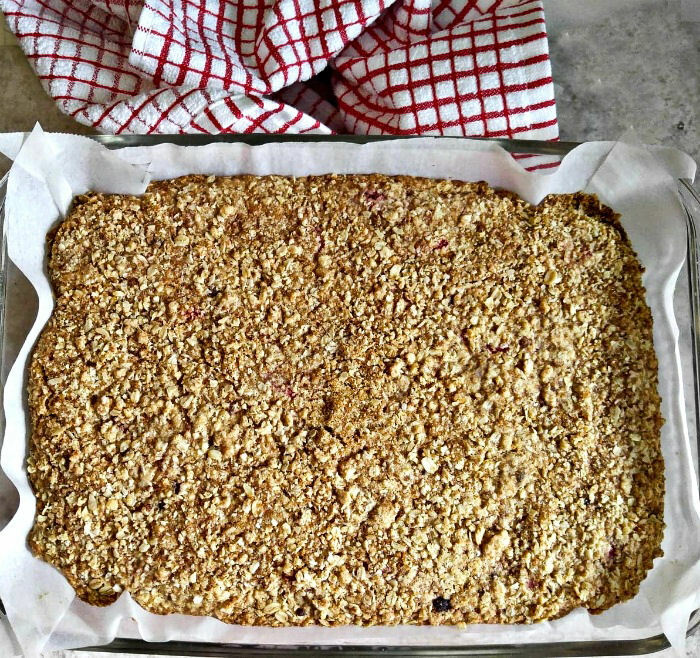 Bring on the taste of summer with these delicious gluten free strawberry oatmeal bars. They are so fresh and tasty and easy to make too. 1/3 cup of granulated sugar. (I like my bars slightly tart. You can use more sugar if you want the bars to be sweeter) Use maple syrup for vegans. Wash and stem the strawberries. Blend ½ of them in an immersion blender or regular blender and set aside. Slice the other half of the strawberries into big chunks. 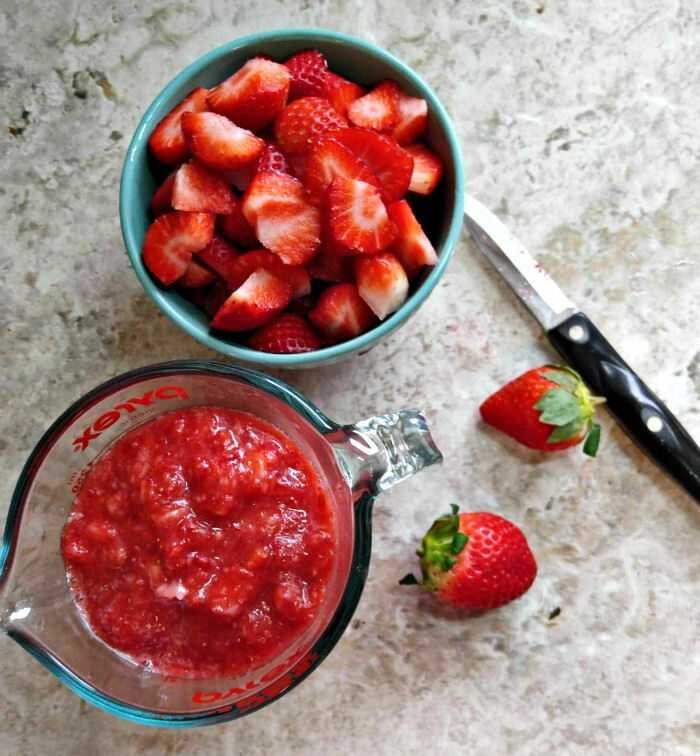 Place ½ of the strawberry puree in a small bowl and add the cornstarch and lemon juice. Stir this to mix well. 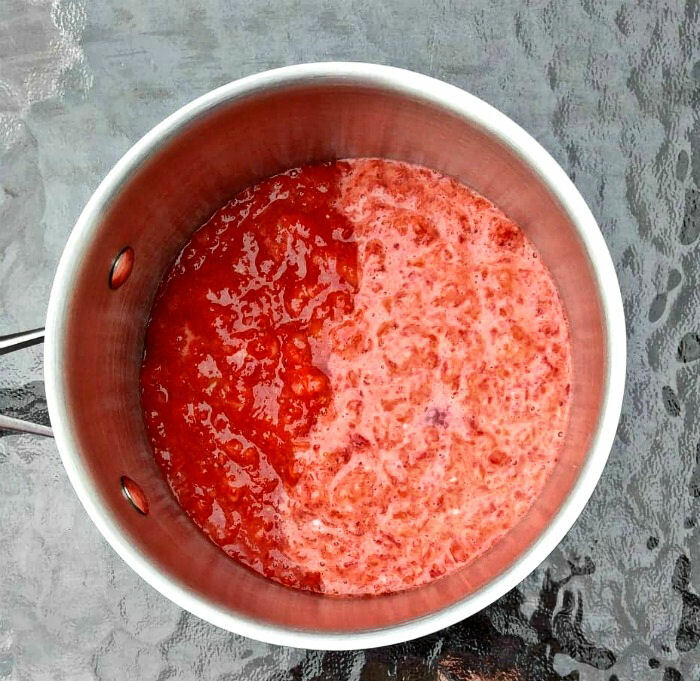 Put the rest of the pureed strawberries into a saucepan and add the puree and cornstarch mixture to the pot. Cook over medium high heat until everything is well combined. Add the chunks of strawberries and the granulated sugar. Bring to a boil, stirring constantly. Cook until the puree thickens. Set aside to cool. Preheat the oven to 350 º F.. Combine all of the ingredients for the crust in a food processor and pulse until you have a crumbly mixture. Place ½ of the mix in the bottom of a 9 x 13" pan that has been lined with parchment paper. Pour the strawberry sauce over the crust. Leave a space of about ½" all around the edges with no topping on it. Add with the remainder of the crust mixture over the strawberry mixture. Cook at 350 degrees for 35 to 40 minutes. Cool completely before you try to cut into bars. The nutrition info is for the gluten free version. The Vegan bars have 159 calories, 8.7 g of total fat, 6.9 grams of saturated fat, 0.7 g of unsaturated fat, 0.0 g of cholesterol, 43.2 mg of sodium, 20.3 g carb, 2 g of fiber, and 9.3 g of sugar.